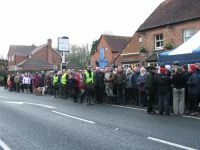 The Highclere Society was formed in 1996 by local people who wanted to protect and enhance the village and its environment for the benefit of the whole community. The About Us page tells you about our activities and what we have achieved for the village. Highclere is a village in North Hampshire. It lies astride the A343 Newbury to Andover road on the north slope of the North Hampshire Downs, between the Downs and the valley of the River Enborne. Other local villages include Woolton Hill and Burghclere. Having good communications links (A34, M4, trains from Newbury to London), it attracts professional people who want access to jobs, services and cultural opportunities, yet live in the countryside. The Society's greatest challenge is to maintain the rural ambience against the pressure for unsustainable development. Now in its 10th year is the Highclere Film Club, which screens top class films twice a month - read Chris Martin's short history (PDF).